K’NEX was founded in 1992 after Joel Glickman started playing around with straws 2 years earlier, and thought about the potential behind them. Some more innovative engineering was then added to this simple idea, leading to the popular rod and connector building system which we have come to know and love today. The K’NEX brand is a world-leading construction toy company, making integrated construction systems accessible to children, and most importantly, fun to play with. The brand has a focus on ‘Building Worlds Kids Love’, and encourages kids to use their imagination during play. 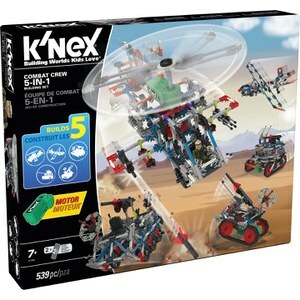 K’NEX offers a wide variety of building sets specifically designed for all ages and levels of skill. Combining gears, pulleys and wheels, these sets allow kids to build really creative and sometimes complex structures, including the popular ferris wheel and rollercoaster sets. The construction process is made simple as each set comes with colour-coded, easy-to-follow instructions so any child can bring their toy set to life. All of these sets come with free UK delivery from The Hut when you spend £30 or more.